sustainable libraries. The heart of this site is the Green Libraries Directories which contains a growing list of green libraries. This website is a work in progress and a labor of love of its administrator. Please check back for new information. You can also submit suggestions to monika.antonelli@mnsu.edu . 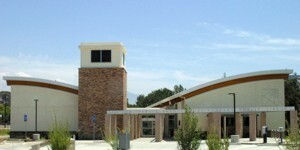 Lake View Terrace Branch Library in Slymar, California is one of the few LEED Platinum libraries in the USA.